Watford moved to within three points of the Championship leaders with a superb win over Sheffield Wednesday. The Hornets took a 2-0 lead via Adrian Mariappa's tap-in and a superb Henri Lansbury finish after a jinking run. Just before half-time, Marcus Tudgay headed in a Tommy Spurr long throw to give Wednesday hope of a comeback. But Jon Harley's curling effort and a second goal for Lansbury following a good run from Tom Cleverley was reward for Watford's second-half dominance. Tuesday's results in the Championship had served to open up the league, leaving seven sides capable of ending this weekend at the top of the table. 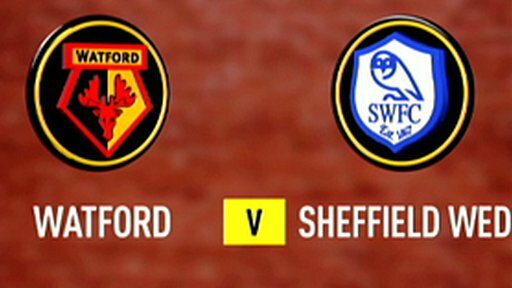 In 12th and 15th respectively before kick-off, both Watford and Sheffield Wednesday knew a win would thrust them into the thick of the top-half tussle. Watford's home form has been poor so far this season but they banished all memory of the 10 goals they had conceded in the last three games at Vicarage Road by taking a 2-0 lead midway through the first half. Wednesday were partly the architects of the Hornets' first goal, failing to clear a corner and allowing substitute John Eustace to find Mariappa in the box with the simple task of tapping into the unguarded net. Watford's second owed more to individual skill as on-loan Arsenal midfielder Lansbury exchanged passes with Cleverley, jinked expertly between two Wednesday defenders and then slotted home under keeper Lee Grant. Wednesday gave themselves hope of a comeback just before half-time when full-back Spurr launched a huge throw-in from the left and Tudgay leapt highest to head past Loach. The next goal was vital and, with 10 second-half minutes gone, the home side crafted it. Having seen an initial corner cleared, Lansbury collected outside the box, created space for himself on the right before feeding Harley in the box and the former Sheffield United man struck the ball past Grant and into the far corner. Their two-goal cushion restored, Watford turned on the style. On-loan Manchester United midfielder Cleverley picked up the ball outside the area, dribbled with intent around the right-side of the Wednesday defence before expertly picking out Lansbury in the middle and he made no mistake with a side-foot finish. Wednesday were inches wide from giving Watford slight cause for concern with quarter of an hour to go when substitute Etienne Esajas' free-kick swung just wide of Loach's right-hand post. "Both boys (Lansbury and Cleverley) are enjoying being here and playing in the Championship week in week out. "They are giving us quality and they have been embraced by the players here. "Clubs have to trust us to develop their players - and two of the best clubs in the country obviously do that, which is a boost for us." "I am bitterly disappointed. They walked through our defence at times, and you just cannot defend like that. "Every one of them has to take responsibility. They were a shambles, and it's the first time I've ever had to say that about my team. "The players are embarrassed by that performance." 90:00+4:24 The match has reached full-time. 90:00+3:07 Etienne Esajas produces a left-footed shot from just outside the box that misses to the right of the goal. 90:00+2:42 Corner from the right by-line taken by Etienne Esajas, save made by Scott Loach. 90:00+1:44 Centre by Luke Varney. 89:43 The referee blows for offside against Nathan Ellington. Lee Grant takes the indirect free kick. 87:33 Tommy Spurr takes a shot. Craig Cathcart gets a block in. 86:56 The assistant referee signals for offside against Nathan Ellington. Free kick taken by Lee Grant. 86:31 Free kick awarded for an unfair challenge on Tom Cleverley by Etienne Esajas. Tom Cleverley takes the free kick. 85:33 Corner taken by Tommy Miller from the left by-line, John Eustace makes a clearance. Tom Cleverley fouled by Akpo Sodje, the ref awards a free kick. Scott Loach takes the free kick. 82:41 Substitution Scott Severin joins the action as a substitute, replacing Jon Harley. 82:09 A cross is delivered by Tommy Spurr, save by Scott Loach. 79:15 John Eustace produces a cross, comfortable save by Lee Grant. 78:35 Tom Cleverley takes a outswinging corner. 77:23 Foul by Lee Hodson on Luke Varney, free kick awarded. Tommy Miller crosses the ball in from the free kick, Craig Cathcart manages to make a clearance. 75:45 Scott Loach takes the free kick. 75:45 Substitution Nathan Ellington replaces Don Cowie. 75:45 The referee blows for offside. 71:21 Unfair challenge on Akpo Sodje by Craig Cathcart results in a free kick. Darren Potter takes the direct free kick. Etienne Esajas has an effort at goal from long range that goes wide left. 71:03 Don Cowie takes a shot. Save by Lee Grant. 70:07 Unfair challenge on Tom Cleverley by Etienne Esajas results in a free kick. Direct free kick taken by Scott Loach. 69:58 Tommy Spurr sends in a cross, clearance made by Craig Cathcart. 68:19 Tommy Miller takes a shot. Save made by Scott Loach. 67:51 Adrian Mariappa concedes a free kick for a foul on Marcus Tudgay. Tommy Spurr restarts play with the free kick. 66:18 The ball is crossed by Luke Varney. 62:23 Substitution Akpo Sodje on for Jermaine Johnson. 61:17 Jon Harley challenges Lewis Buxton unfairly and gives away a free kick. Darren Purse takes the free kick. 60:03 Assist on the goal came from Tom Cleverley. 60:03 GOAL - Henri Lansbury:Watford 4 - 1 Sheff Wed Henri Lansbury fires in a goal from deep inside the penalty box low into the middle of the goal. Watford 4-1 Sheff Wed.
57:11 Centre by Jon Harley. 55:44 A cross is delivered by Jon Harley, Lloyd Doyley has a headed effort at goal from deep inside the area missing to the right of the goal. 55:00 A cross is delivered by Jermaine Johnson, clearance by Craig Cathcart. 53:24 Assist on the goal came from Henri Lansbury. 53:24 GOAL - Jon Harley:Watford 3 - 1 Sheff Wed Jon Harley finds the back of the net with a goal from just inside the area to the top left corner of the goal. Watford 3-1 Sheff Wed.
52:49 The ball is delivered by Don Cowie, Lewis Buxton manages to make a clearance. Inswinging corner taken by Tom Cleverley from the left by-line, clearance made by Luke Varney. 52:10 Corner taken right-footed by Don Cowie to the near post, Luke Varney makes a clearance. 51:23 Danny Graham is adjudged to have handled the ball. Direct free kick taken by Lee Grant. 50:18 The assistant referee signals for offside against Marcus Tudgay. Free kick taken by Scott Loach. 49:58 The ball is sent over by Etienne Esajas, Lloyd Doyley makes a clearance. 49:13 The assistant referee flags for offside against Marcus Tudgay. Craig Cathcart takes the free kick. 48:12 Darren Potter takes a shot. Save made by Scott Loach. 48:12 Substitution Etienne Esajas comes on in place of Michael Gray. 45:01 Substitution (Sheff Wed) makes a substitution, with Tommy Miller coming on for James O'Connor. 45:00+2:17 The half-time whistle blows. 44:56 Assist on the goal came from Tommy Spurr. 44:56 GOAL - Marcus Tudgay:Watford 2 - 1 Sheff Wed Marcus Tudgay finds the net with a headed goal from deep inside the penalty area. Watford 2-1 Sheff Wed.
44:07 Lee Hodson concedes a free kick for a foul on Jermaine Johnson. Darren Potter takes the free kick. 43:20 Darren Purse challenges Danny Graham unfairly and gives away a free kick. Henri Lansbury crosses the ball in from the free kick, Mark Beevers manages to make a clearance. 42:55 Michael Gray takes a shot from 35 yards and missed to the right of the net. 41:57 Jermaine Johnson produces a right-footed shot from deep inside the penalty box which goes wide of the left-hand post. 38:58 Free kick awarded for an unfair challenge on Marcus Tudgay by Craig Cathcart. Darren Potter crosses the ball from the free kick right-footed from right channel. 38:34 The ball is sent over by Darren Potter, clearance by Henri Lansbury. 37:46 Centre by Michael Gray, clearance made by Adrian Mariappa. The ball is sent over by Jermaine Johnson, Lee Hodson gets a block in. Corner taken right-footed by Darren Potter to the near post, Jon Harley manages to make a clearance. 35:07 Foul by Danny Graham on Mark Beevers, free kick awarded. Lee Grant restarts play with the free kick. 32:46 Foul by Mark Beevers on Danny Graham, free kick awarded. Free kick crossed right-footed by Don Cowie. 32:08 The ball is swung over by Danny Graham, Tom Cleverley takes a shot. Lee Grant makes a comfortable save. 31:31 Free kick awarded for an unfair challenge on Don Cowie by Mark Beevers. Direct free kick taken by Adrian Mariappa. 30:14 Danny Graham concedes a free kick for a foul on Darren Purse. Direct free kick taken by Lee Grant. 29:21 Jermaine Johnson delivers the ball. 28:57 Centre by Lloyd Doyley, clearance made by Tommy Spurr. 27:36 Danny Graham fouled by Lewis Buxton, the ref awards a free kick. Craig Cathcart restarts play with the free kick. 27:02 Free kick awarded for a foul by Luke Varney on Adrian Mariappa. Scott Loach restarts play with the free kick. 25:12 Assist on the goal came from Tom Cleverley. 25:12 GOAL - Henri Lansbury:Watford 2 - 0 Sheff Wed Henri Lansbury scores a goal from deep inside the penalty area to the bottom left corner of the goal. Watford 2-0 Sheff Wed.
24:00 The ball is swung over by Michael Gray, save by Scott Loach. 22:46 Michael Gray produces a cross, Lloyd Doyley gets a block in. Inswinging corner taken from the right by-line by Michael Gray, clearance made by Craig Cathcart. 20:04 Assist by John Eustace. 20:04 GOAL - Adrian Mariappa:Watford 1 - 0 Sheff Wed Adrian Mariappa finds the back of the net with a goal from inside the six-yard box low into the middle of the goal. Watford 1-0 Sheff Wed.
18:36 Substitution Ross Jenkins leaves the field to be replaced by John Eustace. 18:36 Jon Harley produces a cross, blocked by Darren Purse. 17:58 Tommy Spurr produces a cross. 17:12 Effort from just outside the area by Marcus Tudgay goes over the target. 15:45 A cross is delivered by Jermaine Johnson. 15:10 The ball is crossed by Lewis Buxton, Scott Loach makes a comfortable save. 14:32 The assistant referee signals for offside against Danny Graham. Indirect free kick taken by Lee Grant. 14:20 The assistant referee signals for offside against Marcus Tudgay. Free kick taken by Scott Loach. 12:10 Lewis Buxton crosses the ball, save made by Scott Loach. 10:13 Free kick awarded for a foul by Craig Cathcart on Luke Varney. Michael Gray sends in a cross, Marcus Tudgay takes a shot. Scott Loach makes a comfortable save. 9:01 Corner taken left-footed by Michael Gray from the right by-line to the near post, Jon Harley manages to make a clearance. 8:15 Jon Harley concedes a free kick for a foul on Lewis Buxton. Centre by Michael Gray, Marcus Tudgay takes a shot. Save by Scott Loach. 6:01 Jermaine Johnson delivers the ball, Adrian Mariappa gets a block in. 5:27 Tom Cleverley crosses the ball, clearance made by Mark Beevers. 3:56 Don Cowie crosses the ball, Lewis Buxton gets a block in. 2:31 Marcus Tudgay produces a header from deep inside the six-yard box which goes wide of the right-hand upright. 1:06 Mark Beevers gives away a free kick for an unfair challenge on Danny Graham. Adrian Mariappa restarts play with the free kick.